Painted at a site a few miles east of Oregon Illinois. A nursery called Hidden Timber – and it is. From the main road it appears to be a homestead. A few yards into the property I realized that this place had a lot of perennial plants and trees. I made my way to a spot among the trees and shade. I nestled in so as to minimize blocking the path. A simple design. As I finished my rough drawing on my canvas, I started right in at my focal point, the plants at the shade. About a half hour into the painting I felt real good about this one. Everything was moving well. No real problems until I got to the foreground. I had not given enough thought as to how I would handle this spot. Took a few moments to examine my options. Fortunately, I made a good decision. The final day of painting at the final Fields Project. The location involved five neighboring farmsteads. By the time I arrived and toured the sites, it was getting late. I took photos for reference and set up to quickly paint a couple small studies. Lunch was a bit of a bummer. I don’t look to get my ego stroked. But on the same note, I don’t like to get put down either. The women that were there were discussing numerous issues of local concern. Eventually one of them asked if I had any news to share about my work. 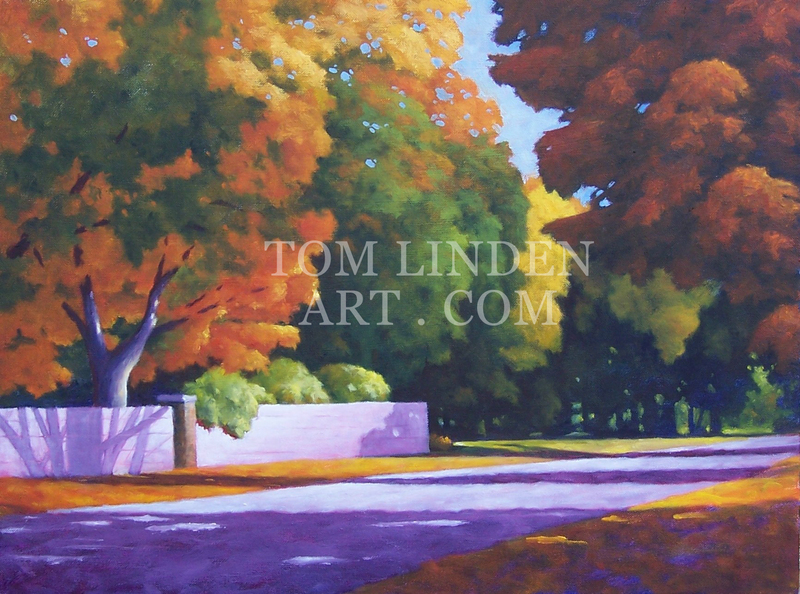 I responded that I just received news from Woodwalk Gallery concerning a very nice sale. Before I could relate what I felt was a humorous quip about the sale, another woman quickly jumped my moment to relate how she just sold three of little works through a local restaurant. Killed the conversation. I finished my lunch and departed. 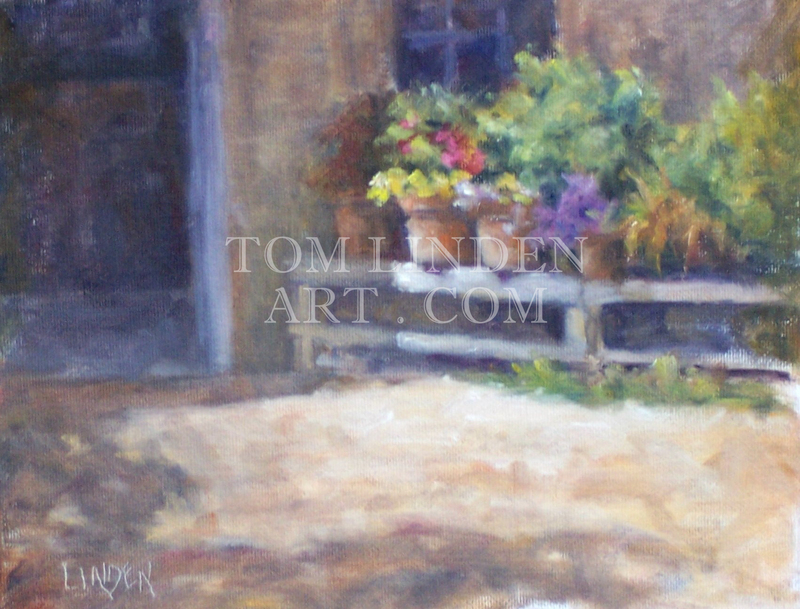 Traveled about an hour to plein air paint with the Oregon group. The site that day was a farm, an alpaca farm. Interesting creatures, but a well cared for and rather sterile farm. I walked around the grounds (with the help of a very friendly dog), but was unable to find anything of interest. I ventured onto the gravel road in front of the farm and ventured about a hundred yards to the east. I decided to set up my gear and paint. I started a painting that was 9″ x 12″. 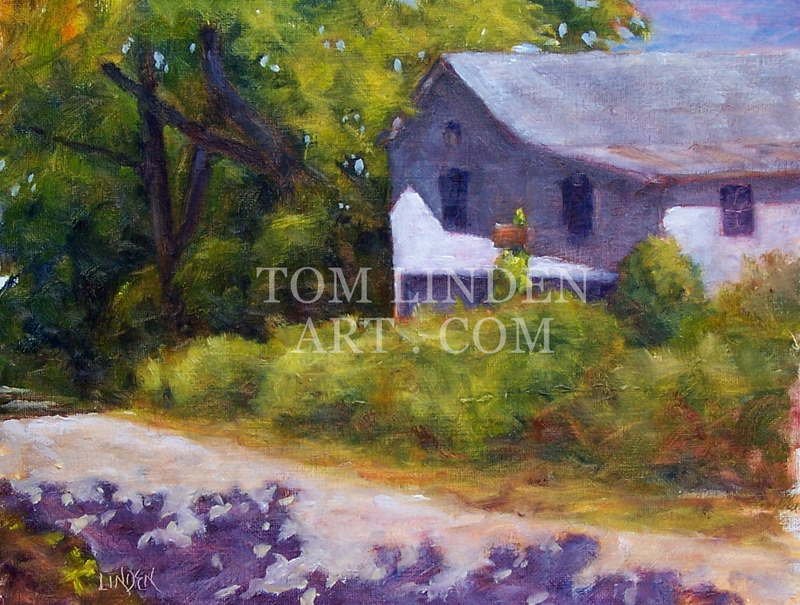 It attempted to capture this idea of venturing down this road but included the house and farm buildings which were along the right side of this road. I fought with the painting for a little over an hour and realized that it was not going to work. One mantra I preach to my students is to “Keep It Simple”, and I did not. The painting was too busy. Too many separate, unconnected shapes and elements. I decided to wipe the canvas clean and use it for another painting. A certain degree of therapy is accomplished with the simple act of removing the mess that was on that canvas. I took a fresh look at the scene and made a couple sketches of this concept. I felt that it would work but I only had about forty minutes before we would break for lunch. Pulled out this smaller 6″ x 8″ canvas and attacked the canvas. Not the greatest painting, but I love the play of alizarin crimson among all the greens. It was more simple and I was able to charge through this painting and finish just in time for lunch with the other painters. The weekly paint out of the Eagles Nest group. Only two of us showed up. Rather than split up, both of us decided to paint from the deck. Not much room left up there. Had been painting about an hour when I heard a noise.A couple was making there way up the long flight of stairs to the deck. They were almost to the top, when they realized that the deck was a bit crowded (two artists and associated paraphernalia). I indicated that there was enough room for all of us. 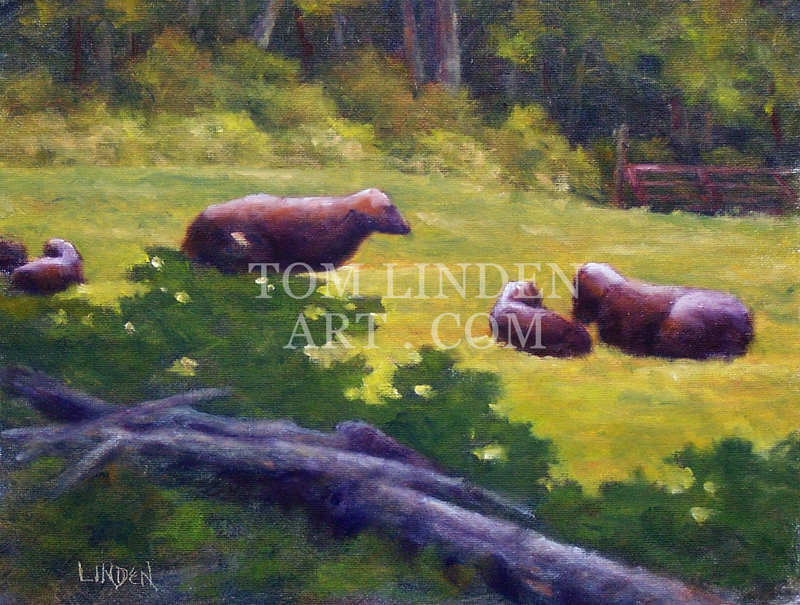 They came up and enjoyed the view and then enjoyed seeing the paintings in progress. About twenty minutes later, different couple, same scenario. Paintings completed, we had lunch in the park before heading our separate ways. Another painting based on work created during last years paint out in Grand Detour. 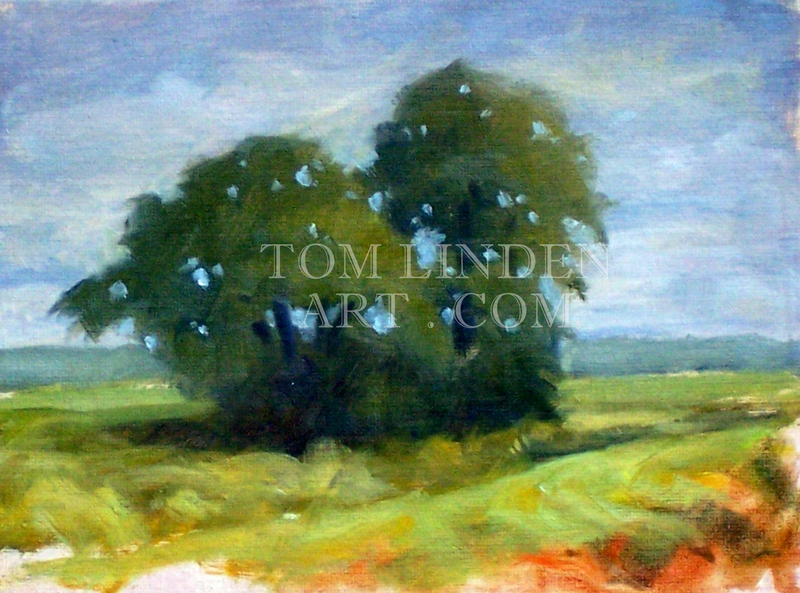 I was fortunate to have sold the little 6″ x 8″ study created that day. I had a photograph of the small painting and a photograph of the scene which helped, I also had a couple of the other small studies to help set the mood as well as guide my colors and temperatures. I found that shortly into this painting I was relying heavily on my memories of my feelings from that day and almost ignoring the photograph of the scene. The painting moved effortlessly and set the stage for a larger version. Last October, the Eagle’s Nest group sponsored a “paint out” in Grand Detour Illinois. The organizers had hoped to draw more artists than we had. Although it was chilly, the sun made it feel warmer. I endeavored to get several small “studies” completed. I wanted to capture the feel of the colors this day.It worked. 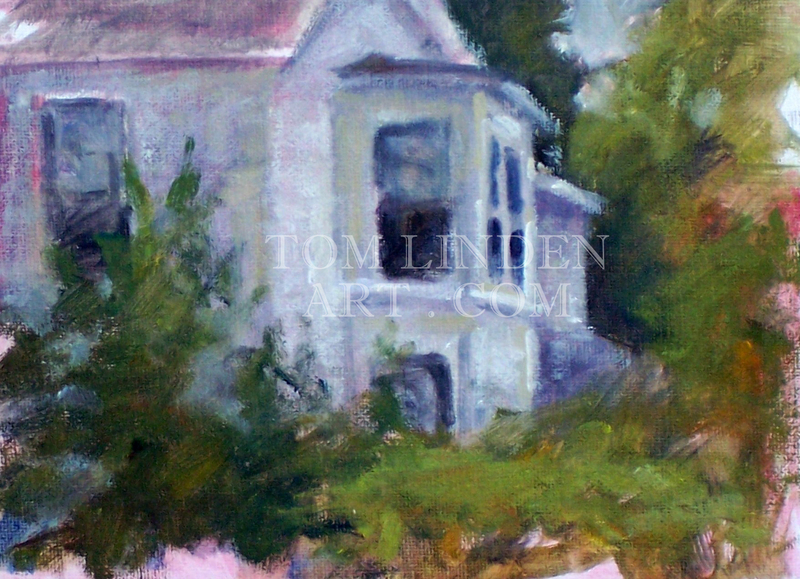 I completed three 6″ x 8″ paintings in the morning and gathered several photographs as well. It was a fun and productive day. After enjoying the small studies for the past year, I decided to tackle the subject again. I found the reference photographs and strategically placed the study to help. Before tackling a full size canvas, I decided to create a small 9″ x 12″ work to help refresh my memory and ensure that I could capture the essence. 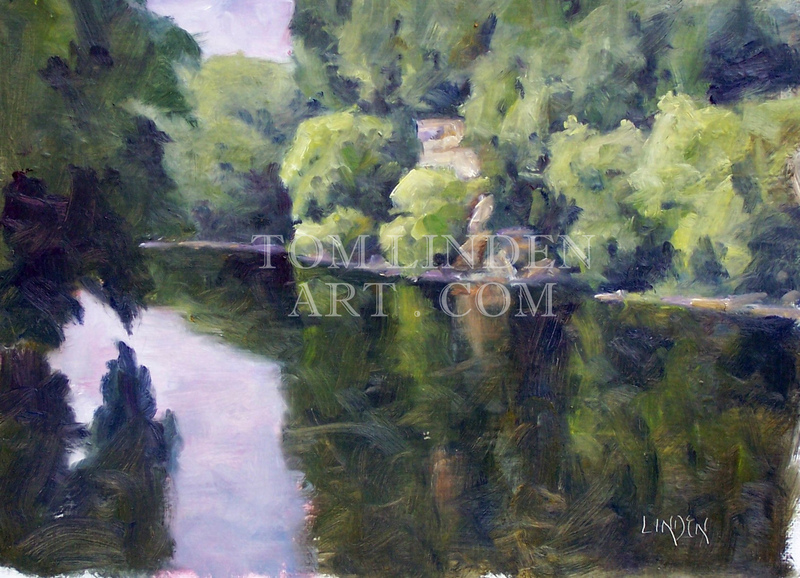 Once completed to my satisfaction, I used the small 9″ x 12″ study as a guide to help me with this larger work. The trees turned out to be a bigger challenge than I expected on this work. Not in the best mood today. It has been a busy three plus weeks between the Edge of the Rock and Theodore Robinson Plein Air Competitions and the 2012 Fields Project last week. Perhaps I was spoiled by the support from the folks in Wisconsin, but I anticipated better results from my efforts in Ogle county. I completed six works during the 2012 Fields Project. Monday was hot and breezy. Vogel’s View. I witnessed this scene on my way onto the property. No need to go all the way up to the farm. I set up along the entrance drive and started. At the start, the barn was void of light. I liked the design and figured that either something would happen naturally or I would have to improvise to make the barn more prominent. 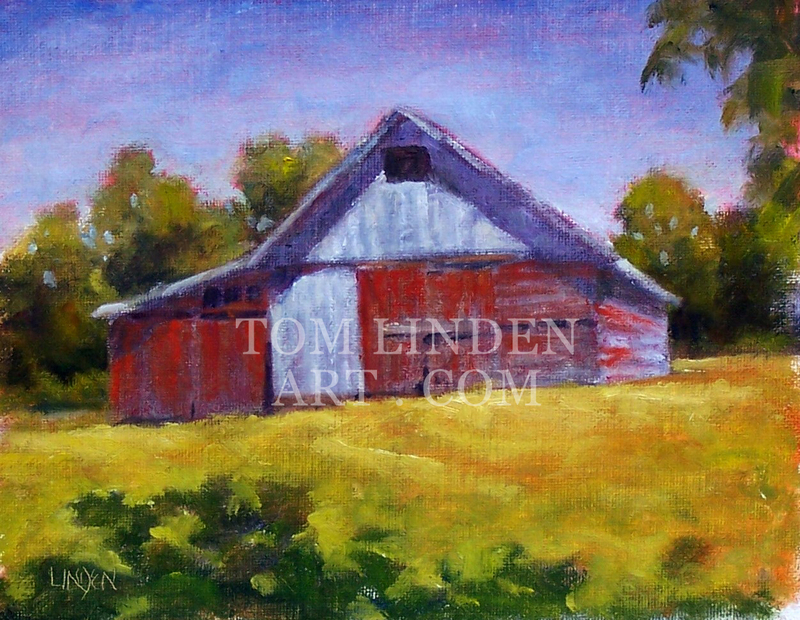 About half way through, the intuition paid off as sunlight hit the front of the barn and gave me this beautiful design. Tuesday, hot and windy again. Coffman’s Cattle. Searched for and found a spot where I would have shade through the morning. Found my subject and started in. Got enough of the design in place before the cattle took off to graze. Note: if it moves, lock it in quickly. My color notes were incomplete, so I improvised a little bit. 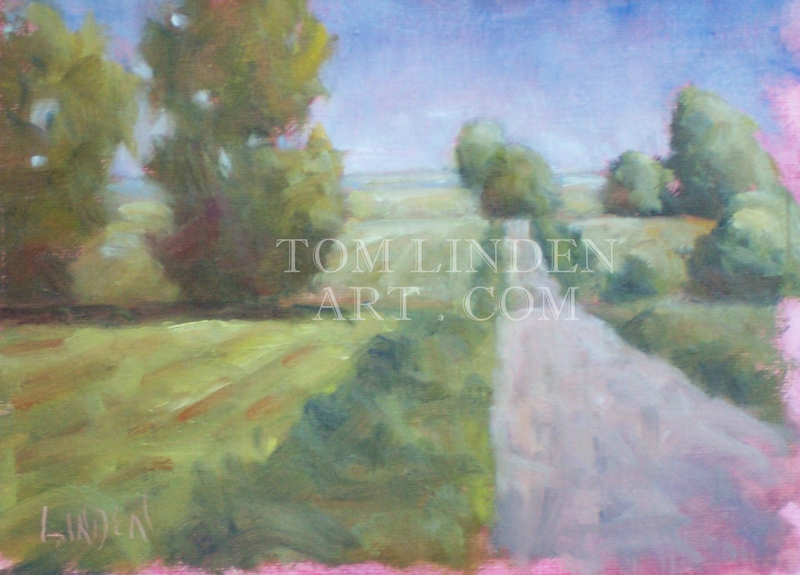 By the early afternoon, my easel and I were getting moved around a lot by 20+ mph winds again. Wednesday, still hot, not as windy. Lewis Shack. Took a while to find the subject. I thought that it was a spring house, though it seemed to be too close to the house for that. Turns out that the owner is a ham radio operator. This shack is where he does his radio thing. Stumped for a title. I could not get past wanting to call it A Radio Shack, but I have a feeling that the legal powers at the retailer would disapprove. 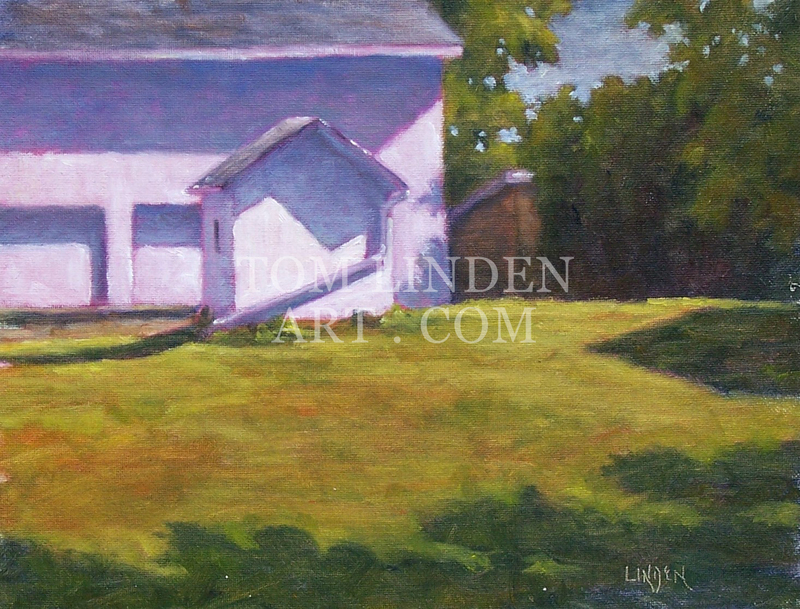 Finished the first then found a shaded spot where I could do a painting of their barn. Small and quick. Thursday, overcast and a little cooler. The location is about 60 miles away. I arrived early and found a great vantage point for a unique view. This painting is not currently published. Friday would be a short day. Center School. The powers to be decided that we should be done and off the property noon-ish. A lot of potential subjects, as well as, a lot of tall grass and brush. I found a shaded spot near the end of the road/drive. I liked that play of the light hitting this building against the deep dark’s of the background woods. I knew that I had a little less than two hours to complete the work. Did it. Back down on Sunday for the exhibition and sale. Wish that I had made better use of the day. Trickles of people throughout the day. I had all six of my fresh paintings from the week plus a number of smaller paintings from the studio. I was disappointed. Not only did my work not sell, nor have any serious looks, but while in conversation with people, I witnessed a couple people take photographs of my work without my permission nor offering to pay for a photograph. You may say “So what?”. I look at this as stealing. The paintings are my product. If you are a farmer with a field of crops ready for harvest and I walk in to your field, grab a couple bushels of produce for my enjoyment and to share with my family and friends. I take your produce without asking your permission nor offering to pay you for the privilege, is that not stealing? How is this different? If people were to request an image, I would be glad to consider forwarding a watermarked version for them. So I finished Sunday and all I was paid was a few complements. It surprises me that for an event such as this which celebrates the agricultural industry in Ogle County and the Plein Air arts tradition in Oregon Illinois that they leave this event short of what it should be for the artists (both the visiting artists and The Eagle’s Nest artists). Why are there no purchase awards made by the city of Oregon, the Oregon library, and or Ogle county. There are a lot of businesses in the county that are agriculture related, yet none of these businesses make any purchases to support the artists efforts. This event has gone on for about fourteen years and the organizers seem pretty content with the current structure. So be it. Perhaps I should stick with the support which I witness at the events in Wisconsin. 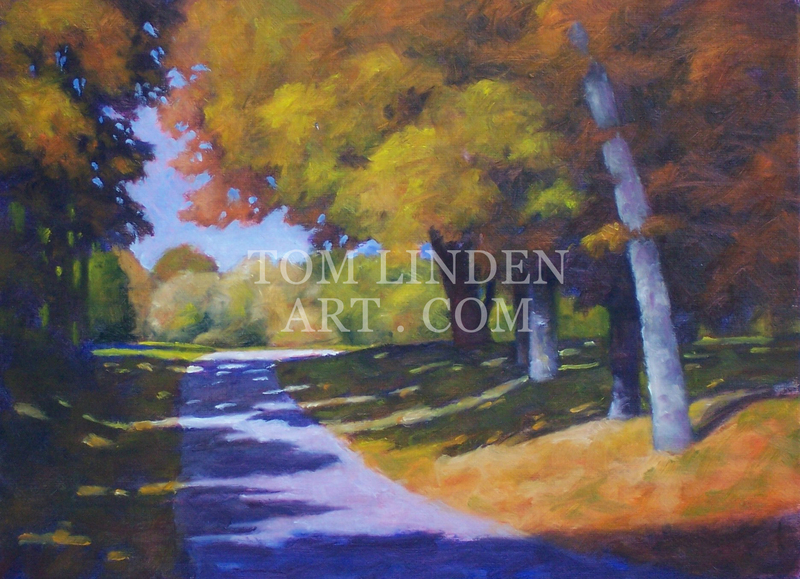 You are currently browsing the archives for the Eagle’s Nest Plein Air Painters category.